1. 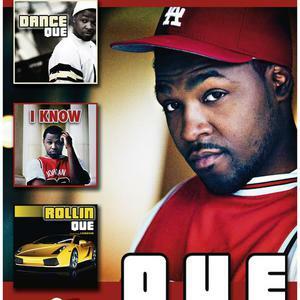 Qwanell Mosley (born on September 28, 1988 in Rochester, New York), better known as Q or Que, is an American singer best known as a contestant on the hit TV show Making the Band 4. He was the youngest member of the group Day26 signed on Bad Boy Records, along with their former label members, Danity Kane and Donnie Klang. Que was one of the five members of the group including, Robert Curry, Willie Taylor, Brian Andrews, and Michael McCluney. In 2007 Mosley went on MTV's hit TV show "Making The Band 4" for which he gave up a full scholarship at Five Towns College. In season 1, after beating out numerous contestants for a spot in Sean 'Diddy' Combs' guy group, Mosley, Robert Curry, Micheal McCluney, Brian Andrews, and Willie Taylor were put in the group now known as Day26. In late 2007, the show came back for a second season, with the group working on their first studio album (self titled Day26), along with fellow Making The Band 4 winner Donnie Klang and Making The Band 3 winners, girl group Danity Kane, living in a house together, all recording new albums and often competing with each other. Since Season 2 of Making the Band 4, Mosley has been romantically involved with fellow Making the Band winner Dawn Richard. In late 2008, "Making The Band 4" came back for a third season, which followed Danity Kane and Day26 on tour, living in a house together, and enjoying life. Instead of "making a band" the shows focus turned into a The Real World type show, focusing on friendships, relationships, and drama in and out of the studio and the industry. Mosley and Richard recorded a song entitled 'Broken Promises' in late 2008. Day26 and Donnie Klang came back in August 2008 for Making the Band 4, Season 3, Part 2. With only Dawn Richard and Aundrea Fimbres, two former members of Danity Kane, came back (Aubrey O'Day and Wanita "D. Woods" Woodgette were personally fired by Diddy and Shannon Bex refused to come back since the end of the first part of season 3). During the season, he and the group recorded their second studio album and while doing so, Mosley had frequent arguments and disagreements with the other members of the group, leading the public to think he was "crazy", and even "bipolar". However he was not given the boot and he and the group worked out their issues and went on to promote their second album. After Making The Band 4, Season 3, Part 2, Day26, and the show was said to not be returning to television anymore, and it was an end of an era. Although, the group was still intact and going strong, aside from the strength and popularity that the show usually would've given. On December 18, 2009, Que confirmed that Day26 had asked him to leave the group, and he was later removed from the group. He stated that all he wanted was an audit, and new management, but the group simply did not agree and was forced to remove him from the group. Que also stated that he did not want to leave, but respects their decision, and wishes them the best. He also said on his latest ustream video that he doesn't mind recording with the group again.